We've been spreading the word ... the time has finally arrived for us to get crazy. • Read through the pattern instructions before beginning. 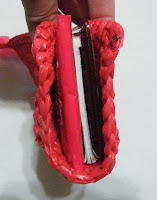 • When using plarn, it’s a good idea to stretch your work after every couple of rows. This will give you a more realistic view of what you have completed up to that point. • Ch 1 at beginning of each row is not counted as the 1st stitch. • Plastic in general is susceptible to ripping/tearing due to its very nature. o Weaving in ends - it is best to maneuver your craft needle in between the stitch or stitches to avoid splitting the plastic yarn. I typically don’t suggest making a practice swatch because achieving a certain height/width is an individual preference. However, it is suggested to ensure the Organizer is the wide enough for what you propose to put in it. Ch 22, hdc in 2nd ch from hook and each st across. Row 2-4: Hdc in each st across. Lay piece on flat surface and place the widest item that you will put in the Organizer once it is completed on top. The piece should be slightly (not much) wider than the item. If more width is needed, try again with additional # of ch sts until desired width is achieved. With H hook and main color, ch 22 or # determined with practice swatch. Row 1: Hdc in 2nd ch from hook and in each ch across. Ch1, turn. Row 2 – 22 (or desired height): Hdc in each st across. Finish with right side. (Tip: Depth determines Height. To ensure an accurate height is achieved, fold the piece in half and place whatever you will be using the Organizer (e.g. checkbook, calculator, cell phone, etc.) for inside. This gives a more accurate way of determining if additional rows will need to be added for height. Ch 1, sc in end st (1st corner) and in end st of each row to corner, 3 sc in corner, across edge to corner, 3 sc in corner, sc in end st of each row matching up with opposite side (Important: evenly match up sts on both sides or the rows will not have a straight line appearance when stitching up the sides, refer to photo 6), 3 sc in corner, across edge back to corner, 2 sc in corner (back at 1st corner), join with a sl st in beginning sc. Fasten off, weave in ends. With contrasting color and wrong side facing you, join with a sl st at the corner and sc in each st across, ch 1 turn. Sc in each st across. Fasten off leaving about 6” tail for sewing sides together. Fold piece in half lengthwise with right sides together (wrong side out), st sides together with tail. (Stitch Suggestion – whip st the blo of one side and flo of other side [the 2 sts back to back]). 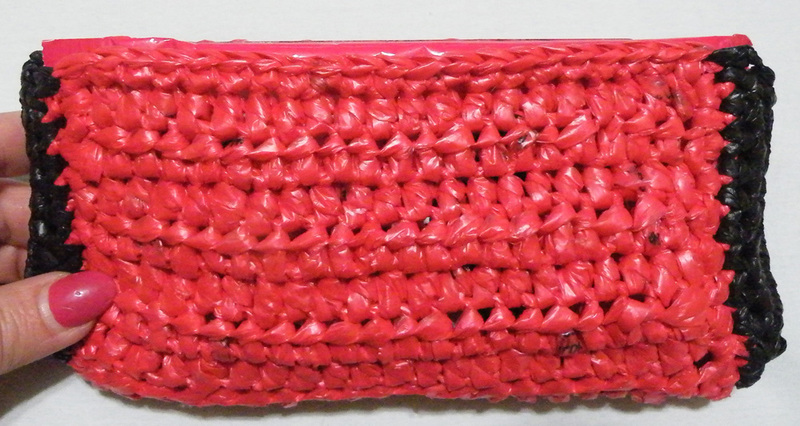 Fasten off; weave in all loose plarn ends. 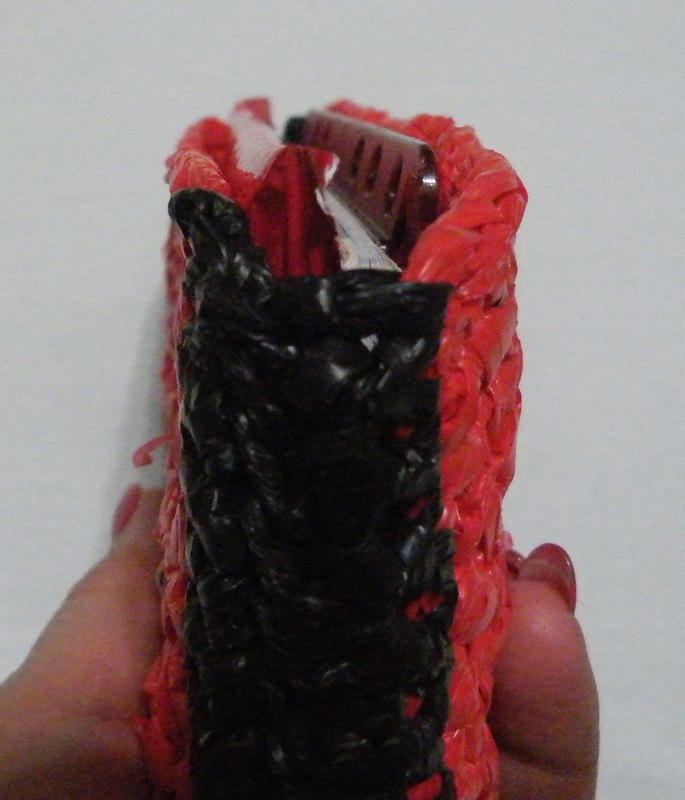 Turn pouch inside out and push out bottom corners. Just give the pouch a good stretch, tug and pull on both the front and sides. a sl st in 1st sc st.
1) Both used a ch base of 28 w/hdc in 2nd chain from hook instead of the ch 22 I used. 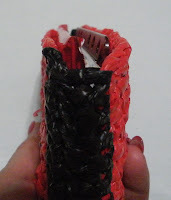 RecycleCindy is using newspaper sleeve plastic yarn which would have a completely different texture/thickness than the Dollar General or Lowe's plastic yarn I have used. 2) Ch 2 at row end was used as an alternative for a more taylored edge. This is so awesome!!! Keep the feedback coming -luv it!!! I'm just starting my wallet now. I did find I need it taller so did ch 28 to begin. 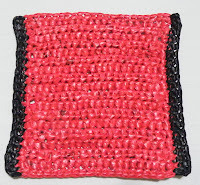 I'll be posting more as I go over at the Trash to Treasures group on Ravelry where we are doing your Crochet Plarn-along.